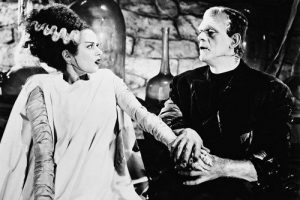 Bride of Frankenstein begins with Mary Shelley informing her friends that she has written a sequel to her masterpiece. She begins this story at the end of Frankenstein with Dr. Henry Frankenstein (Colin Clive) recovering from his injuries, and the mill fire still crackling. A curious villager and his worried wife are watching the fire when a familiar hand strangles the man and throws the wife down to her death.Minnie (Una O’Connor) starts screaming when she spots the monster walking away from the ruins. The monster runs away before the mobs can begin their monster hunt again. Henry refuses to accept the monster as his creation and decides to quiet the evil experiment business to follow in the family business. 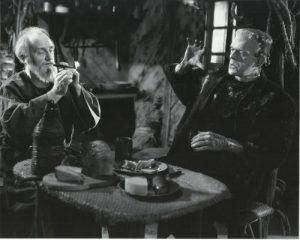 Sometime time later Frankenstein and his fiancee Elizabeth (Valerie Hobson) are visited by his former mentor, Dr. Septimus Pretorius (Ernest Thesiger). Henry is invited to see Dr. Pretorius’s creations. When Henry arrives he finds out that Dr. Pretorius has made several homunculi, the evil doctor “convinces” Henry to join him in his mad scheme to give the monster a bride. Meanwhile, the monster is on the run. Running into new dangers along the way until he finds a friendly blind hermit (O. P. Heggie) that gives him shelter and friendship. I won’t spoil Bride of Frankenstein for you. I highly recommend watching this film for yourself. Dr. Henry Frankenstein (Colin Clive, Frankenstein): Dr. Frankenstein is a much better character in this film because he has to deal with the consequences of his monster’s action. Even though Colin Clive was drunk the whole film again. It actually added to the character, rather than detract. Elizabeth Lavenza (Valerie Hobson, Werewolf of London): Henry’s faithful fiancee. Dr. Septimus Pretorius (Ernest Thesiger): A madman with the dream to mix black magic, and science. He is an eerie, selfish, charismatic villain that will steal any scene he is in. The Monster (Boris Karloff, Bedlam): The monster is much more sympathetic in this film. He has learned from his mistakes, and tries to help others but doesn’t know how to. He also learns to speak in this film. The Monster’s Mate (as ?) (Elsa Lanchester, David Copperfield): The monster’s unwilling bride. Her movement is graceful like a swan but has quite the temper. Minnie (Una O’Connor): The woman that informs the village of the monster’s return. Hermit (O. P. Heggie): The monster’s only friend, sadly the monster is his only friend as well. He is one of the warmest and welcoming characters in this series, but he’s been abandoned by everyone in this small town. One of the most tragically realistic portrayals of isolation in film history. 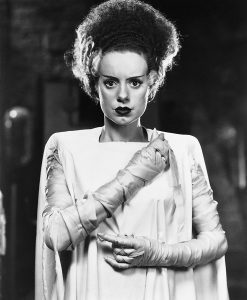 Mary Wollstonecraft Shelley (Elsa Lanchester): An excellent portrayal of Mary Shelley. Calm, collected and wiser than Lord Byron, or Percy. Percy Bysshe Shelley (Douglas Walton, Mary of Scotland): An excellent portrayal of Percy Shelley. A forgettable man who believes that his work will outshine his wife’s masterpiece. Lord Byron (Gavin Gordon): An excellent portrayal of Lord Byron. An egomaniac, that is convinced that he is God’s gift to humanity. The settings, as in the original Frankenstein film, are beautiful, and well shot. The hermit’s cottage is warm and inviting. The graves are lifeless, as the corpses inside them. Dr. Pretorius’s lab is mad, and confusing as the evil doctor himself. In Bride of Frankenstein, the special effects are much more impressive than the setting. The homunculi scene is still visually amazing. The monster’s makeup has changed slightly. Where the sloppy seams are you can see the limbs are healing and becoming a complete man. It’s a small detail that makes a world of difference. The bride was designed to be beautiful and to last — the ultimate Galatea. And the bride’s makeup reflects that. Her stitching is orderly so when her flesh begins to heal it won’t be very noticeable. The bride’s form is very similar to Elizabeth’s. Her face is attractive, and her walk is somewhat graceful for such a young creature as herself. The only thing really odd about her appearance is her skunk hair that reaches the heavens. Her hair is ridiculously stupid, but that is because of other people meddling. The creature’s appearances are iconic because they are striking. Boris Karloff didn’t like the fact that the monster speaks in Bride of Frankenstein. I believe it improves Bride of Frankenstein immensely. This film shows that it isn’t always the monster that is evil. That people need to take responsibility for their actions because there may be horrible unintended consequences. This film would make Mary Shelley proud to have her name on it. I cannot praise Bride of Frankenstein enough, you have to see this for yourself.